Yesterday I did something, that as a proud New Yorker, I almost never do: I waited on line. In fact I waited on a VERY long line to gain entrance to a structure that had not been open to the public for twenty-seven years. 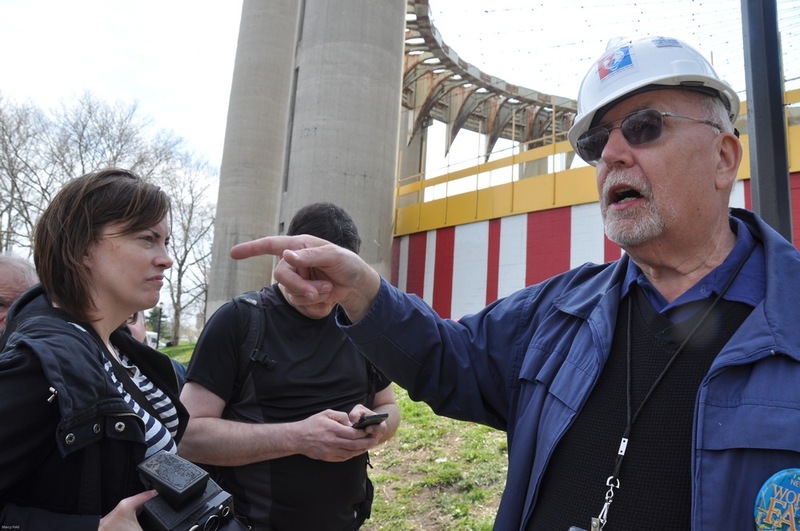 That structure was the New York State Pavilion and yesterday, Earth Day, 2014, was also the 50th anniversary of the opening of the 1964-65 World’s Fair in Flushing Meadows Corona Park in Queens. I read about this happening over a month ago on the Gothamist, where the event was described as a unique photo op so I marked my calendar accordingly. The Parks Department, together with the volunteers of the New York State Pavilion Paint Project planned on opening the corroded iconic structure for a brief 3 hour window to gain some media attention in the hopes of generating interest that might help raise the 40+ million necessary to restore it to its original and formidable glory. The structure, an open-air pavilion entitled the "Tent of Tomorrow" along with it's complimentary observation towers were designed by renowned Mid Century master and architect Philip Johnson. Although I have probably passed the grounds thousands of times over the last 50 years, I had last been in the pavilion 50 years ago when I visited the fair with my school and was anxious to get an up close look. So I took the #7 train and emerged in Queens a little before 1 pm to find many of the park’s trees in full bloom, the Unisphere still majestic and an incredibly long line to enter the pavilion. My first impulse was to blow it off, but it was such a magnificent day and the truth is, I had no idea how really long the line was, so I made my way past the bridge that crosses the Grand Central to the end of the line which was at the other end of the park. While I waited I hoped not to be disappointed but inherently knew that the experience alone would be worth the price of admission, which by the way was free! So I began to photograph what I saw around me. There is true beauty amongst these ruins and the splendor of Earth Day made it magical. 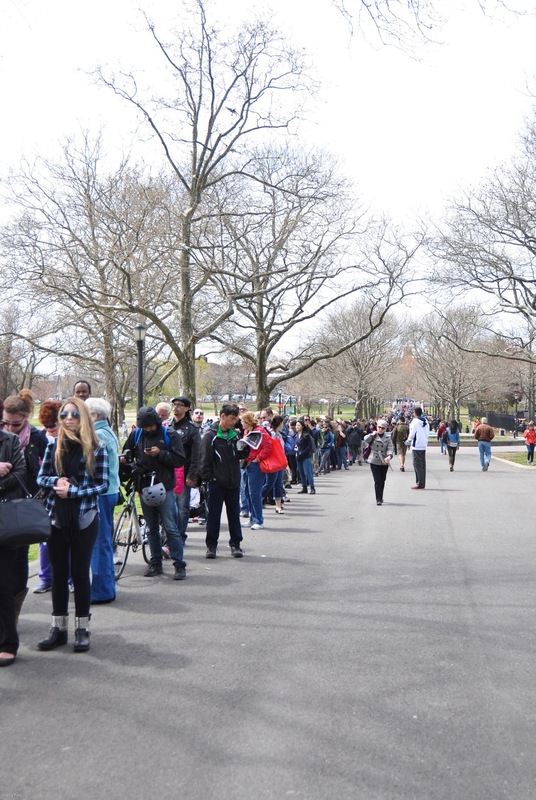 About 2 ½ hours later, we finally reached the end of the line, and by we, I mean the two people standing behind me as well as the two people standing in front of me and we realized that everyone in front of us had received a ticket. We were then told that the building would only be open until 5, that they had no more tickets left and that we would probably not get in. Many of the 2000+ people with tickets were still waiting to don their hard hats and make their way into the structure. The two people in front of me left, but I wasn’t quite ready to give up despite the fact that I already knew that entering the structure would be anti-climatic. Moments later I was rewarded for my patience. 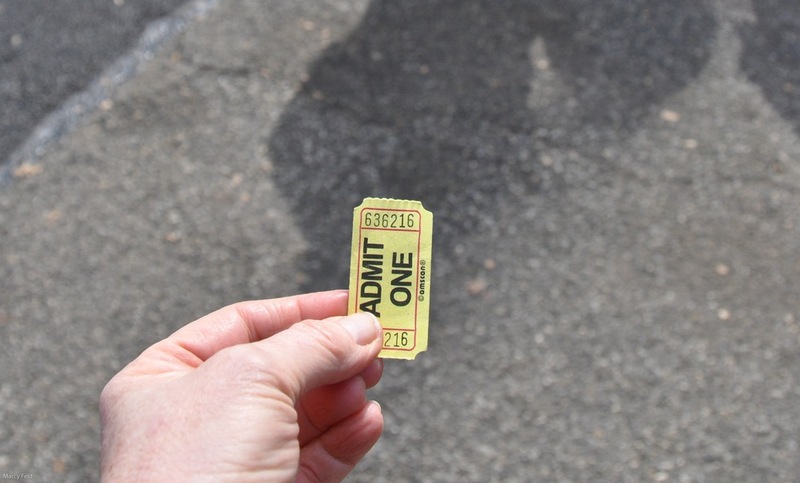 A man who could not wait any longer handed his 2 tickets to a volunteer who offered them to us. I received one ticket and my newly acquired friend, received the other. And while we continued to wait patiently for our numbers to be called, I continued to take photographs. So many people were waiting for their numbers to be called - some in period attire. 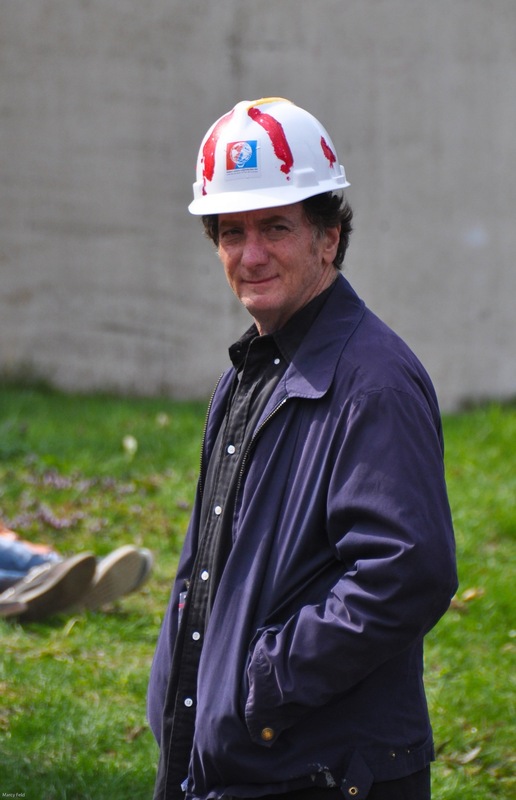 And Hard hats seemed like the latest fashion trend. 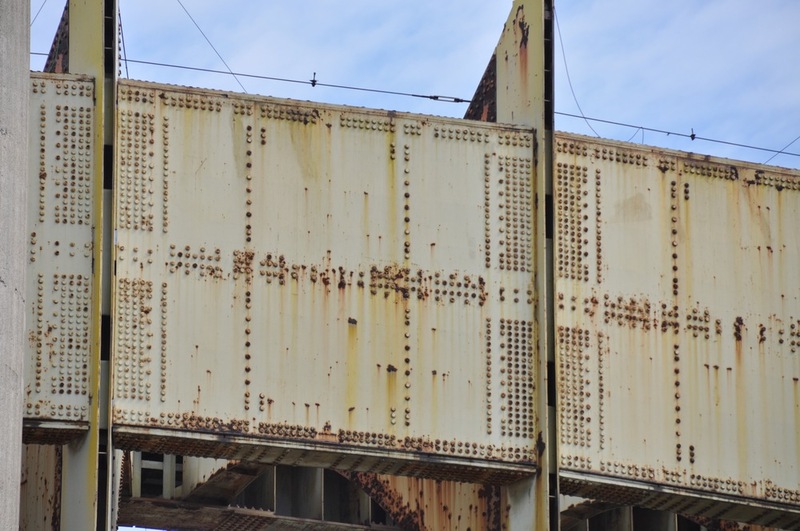 When our numbers were finally called, we grabbed hard hats and entered – and while it was underwhelming in it’s current condition, I was reminded of its incredible history and the boundless potential this rusted relic had. And rather than write about some of what I learned- I've photographed the boards that were up inside the "Tentless Tent". 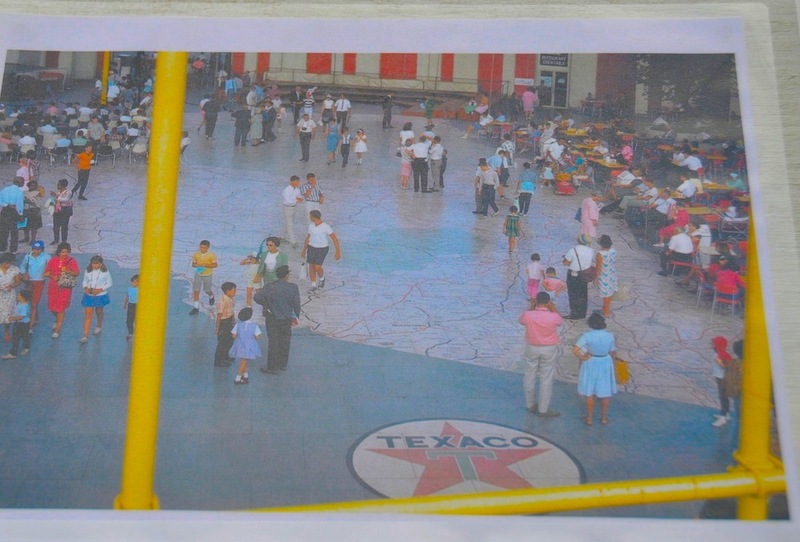 The Roof Of The "Tent Of Tomorrow"
And the Floor of the Tent was made of terrazzo tiles; a recreation of the Texaco map of the State of New York. In 1972 the Tent became a roller rink. The terrazzo tiles remained as the floor with a protective plastic coating. The rink closed in the summer of '74 when the city found the roof to be unsafe and the roof tiles were removed in 1976. When I emerged, less than 10 minutes later, I learned that the National Trust for Historic Preservation had named the pavilion as the trust’s newest National Treasure, a status that will help raise awareness and hopefully funds to restore this gem to it’s original grandeur. A perfect ending to a perfect day, long lines and all. 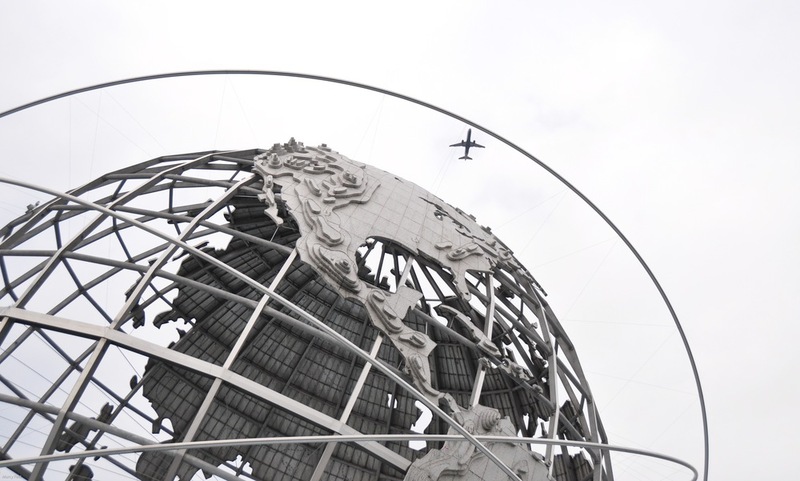 As i headed back to the train, I paid a second visit to the Unisphere, which is exquisite from every angle. And noticed that the squirrels in Corona Park are quite hefty. I found one munching on a french fry and another eating what seemed to be a powdered donut. It was a magnificent day spent at a Fair to Remember. If you would like an opportunity to visit this wondrous place, there is going to be a World's Fair Anniversary Festival on Sunday May 18th from 1-5:30 with a concert and fireworks and I am told that the pavilion will be open once again. For more information visit www.nyc.gov/parks.